Chairman Dr. Dan Eichenbaum | Cherokee Co N.C.
MURPHY, N.C. – At its Thursday, May 10, meeting, the Cherokee County Board of Commissioners heard from Garry Whitaker, a Winston-Salem attorney involved with federal litigation against pharmaceutical manufacturers and distributors concerning the national opiod epidemic. Whitaker told commissioners 643 government entities nationwide are apart of the litigation seeking compensation for damages incurred from the opiod epidemic. Of those entities, Whitaker stated, 43 counties and 6 cities were in the state of North Carolina. According to date presented by Whitaker, since 1999, over 15,000 people have died in North Carolina as a result of opiod overdoses. In that time, 93 opiate poisoning deaths have occurred within Cherokee County alone, with double-digit spikes seen in the years of 2010 and 2011. “This is a serious problem,” Whitaker stressed. According to Whitaker, for every 100 persons in Cherokee County, 125 prescriptions were issued in 2016. Whitaker stated the national average for this statistic is 66 prescriptions per 100 persons. Whitaker explained the litigation group consists of a consortium of six legal teams and firms from throughout the country. “It is our contention that (pharmaceutical manufacturers) have oversold the benefits and undersold or trivialized the risks (of opiods),” Whitaker stated. Giving a brief history of opiods and legislative control of the drugs, Whitaker stated in the past opiods were prescribed mainly to cancer and surgery patients and not for chronic pain but that a shift in thought from pharmaceutical companies has contributed to the opiod epidemic. Whitaker further explained the suit is intended to go after pharmaceutical companies only and not individual doctors or pharmacies, saying that this prospect is simply not feasible. After a series of questions about the suit from County Attorney Darryl Brown, no decision was made by the commission whether or not to move forward with joining the litigation. Cherokee County Tax Assessor Eddie Allen presented commissioners with bids for the county’s 2020 property revaluation. According to Allen, the revaluation will fulfill the state mandate that all counties update appraisals for all parcels within the county every eight years. Cherokee County contains approximately 33,000 parcels of property, Allen added. Allen told the commissioners bid proposals were sent to all 15 appraisal firms except one that are approved by the North Carolina Department of Revenue. Of those, only two firms – C.B. Ferriss, Inc. and Tanner Valuation Group, LLC – submitted bids to the county. A third firm submitted a bid but withdrew that bid from consideration. Allen recommended C.B. Ferriss for overseeing and managing the revaluation, saying if he had to hand-pick one of the 15 state-approved firms beforehand, it would have been C.B. Ferriss. The C.B. Ferriss bid of $220,000 would include appraisal of commercial and industrial properties, assistance to the county through the appeal process, training of the Cherokee County Tax Assesssor staff, and continual reports to the county manager. Allen stated it was important to train staff, so that the county could save money with an in-house revaluation in the future. 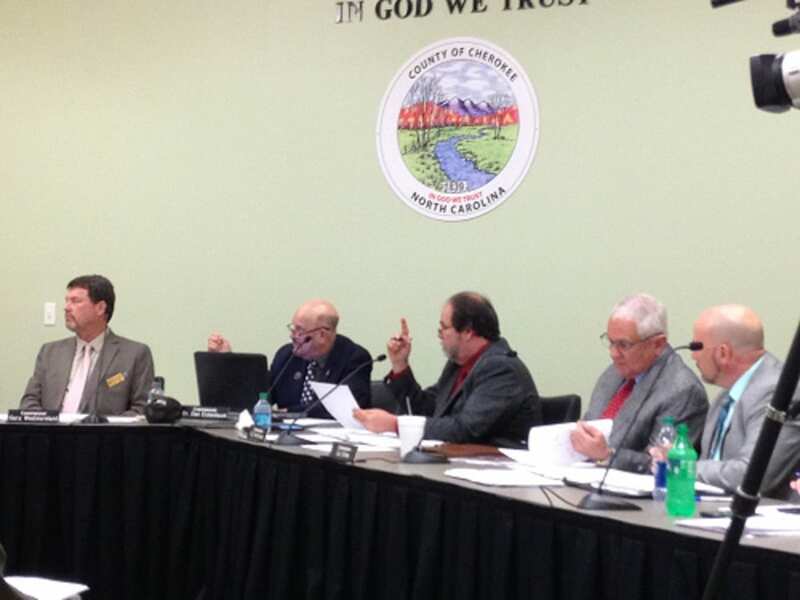 Commissioners unanimously awarded the project to C.B. Ferriss. 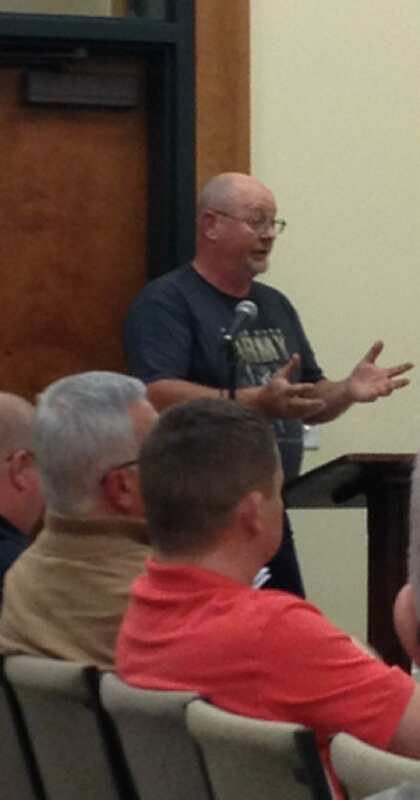 Captain Mark Patterson, of the Cherokee County Detention Center, presented a capital items request to use revenues in the amount of $279,650 for a number items to be used by the detention center. “I think we ought to hear him out and see what the request is,” Commissioner Roy Dickey said. According to Patterson, the request covers the purchase of two 2018 Chevrolet Tahoes and equipment, a new transport van and equipment, a new transport car and equipment, a road crew truck, a fingerprint machine, a kitchen fryer and steamer, radios, 14 bulletproof vests, 14 Glock pistols and holsters, ammunition, a Fort Knox gun safe, and HVAC units. Patterson also told commissioners the detention center is over its projected revenue of $750,000 for the year and stated by the end of the 2017-18 fiscal year, revenues should be close to $1.2 million. When the board asked Patterson what were the most critical items within the request, Patterson stated the fingerprint machine ($21,000), the bulletproof vests ($8,100), the weapons ($6,800), and the ammunition ($3,300) were the most critical. After further discussion, Commissioner C.B. McKinnon then made a request to purchase only those four line items of the request so as to allow more time to research the request further, particularly the vehicle purchases, which accounted for the bulk of the request. After a second from Eichenbaum, the motion failed 2-3 with Eichenbaum and McKinnon voting in favor. After a motion by Dickey to approve the entire request and a second by Commissioner Gary Westmoreland, the request was approved 4-1 with McKinnon voting against. In his county manager report, Wiggins presented a proposal of the 2018-19 budget to commissioners. According to the recommended proposed budget, the total county budget would be $44,212,558.00, which would include a general fund balance of $38,083,967 and a special revenue fund of $6,128,591. Wiggins stated the county would continue with a budget work session Wednesday, May 30, at 5 p.m. and a public hearing on the budget during the regular commissioners meeting Monday, May 21, at 6:30 p.m. Copies of the budget, Wiggins said, will be posted at both libraries in Murphy and Andrews, at the county manager’s office, and on the county website. Commissioners approved four budget revisions Thursday including a $722,884 budget revision to purchase a new CAT compactor for the county landfill. Chairman Dr. Dan Eichenbaum explained that the county had put aside $578,584 over the past few years in a designated fund in anticipation of the purchase. The compactor, according to County Manager Randy Wiggins, comes with included servicing and a five-year warranty. A budget revision for $68,295 was also approved for the purchase of new scales for the county landfill. Wiggins explained the current scales at the landfill can no longer be calibrated and the new scales are expected to be installed sometime before the end of June and on a weekend. 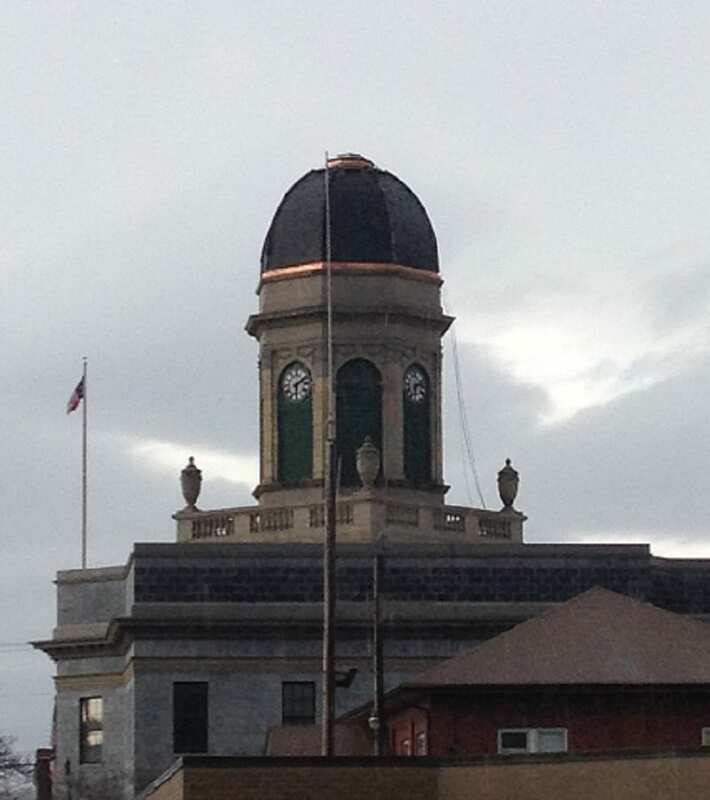 With the request, an additional amount of $12,500 was approved in the case that the county has to use rental scales while the new scales are being installed. A budget revision for $16,755 was approved to purchase a used 2014 Dodge Charger for the Sheriff’s Office. Finance Director Candy Anderson explained the vehicle will replace another vehicle that was damaged in a recent chase and the $16,755 is money the county received from insurance claims. 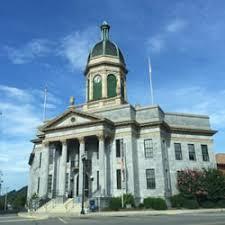 MURPHY, N.C. – Tuesday’s primary election yielded two tight local races and decided several other local races with no Democratic opposition moving into the November general election, according to unofficial results from the county Board of Elections. Nationally, incumbent Mark Meadows won in a landslide over challenger Chuck Archerd both at the county level and district-wide in the Republican primary for the U.S. House of Representatives District 11. In Cherokee County, Meadows took 3,221 votes for 88.17 percent compared to Archerd’s 432 for 11.83 percent. Across the 16-county district, Meadows took 86.35 percent of the votes for a total of 35,438 votes while Archerd took 13.65 percent for 5,600 votes. In the Democratic primary U.S. House District 11, Phillip G. Price edged out candidates Steve Woodsmall and D. Scott Donaldson. Within the district, Price garnered 13,403 votes for 40.58 percent while Woodsmall and Donaldson took 10,286 votes (31.14 percent) and 9,342 votes (28.29 percent), respectively. In Cherokee County, Price won with 204 votes (39.84 percent) compared to Woodsmall’s 162 (31.64 percent) and Donaldson’s 146 (28.52 percent). Price will go on to face Meadows in the November general. With no Democratic opposition coming in the fall election, the sheriff’s race was decided last night as Republican incumbent Derrick Palmer defeated challenger Dan Sherrill. Sheriff Palmer received 2,732 votes for 71.50 percent while Sherrill picked up 1,089 votes for 28.50 percent. The two closest races of the night were both for Cherokee County Board of Commissioners seats. 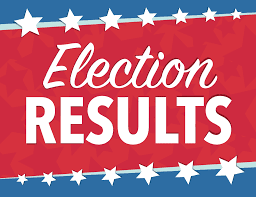 Republican incumbent Dr. Dan Eichenbaum narrowly defeated Winfield Clonts by 40 votes for the Board of Commissioners District 4 primary. Commission Chairman Eichenbaum took a total of 1,919 votes for 50.53 percent while Clonts received 1,879 for 49.47 percent. No Democrat qualified to run the November election; therefore, Eichenbaum will retain his seat on the Board of Commissioners. Another close commissioners race was for the District 1 seat. Republican incumbent Cal Stiles edged out challenger Tim West 1,938-1,863 (50.99 percent to 49.01 percent). Stiles will face Democrat challenger Gary James, who ran unopposed in the primary, in November’s general election. The District 3 Board of Commissioners seat was also on the ballot last night as Republican incumbent Gary “Hippie” Westmoreland faced challenger Corey V. Bailey. Westmoreland won with 2,686 votes for 72.52 percent while Bailey took 1,018 votes for 27.48 percent. Westmoreland will also retain his seat on the board as there is no Democratic opposition in November. Four seats on the Cherokee County Board of Education were also on the primary ballot. An At-large race featuring Republican candidates Keesha Curtis and Tylor J. Dockery saw Curtis win with 1,707 votes (51.59 percent) to Dockery’s 1,602 (48.41 percent). Curtis will face Democrat incumbent Tim Coffey, who ran unopposed in the primary, in the general election for the At-large seat on the board. The District 3 Board of Education Republican primary saw three candidates vying for two seats from the district. In this race, the top two candidates received seats on the board. Overall, Joe Wood received the most votes with 2,481 and 42.47 percent while Mark Patterson took second with 1,767 votes and 30.25 percent. Incumbent Paul H. Brown lost his re-election bid as he finished with 1,594 votes and 27.29 percent. No Democrats qualified to run in the November general election; therefore, Wood and Patterson will assume seats on the Board of Education. Rounding out the Board of Education races, Jeff Martin defeated Jeannie Gaddis in the Republican primary 2,397-1,175 (67.11 percent to 32.89 percent) in the District 2 race. Martin has no Democratic opponent in the general election and will take the District 2 seat on the board. Overall, for the county, 4,391 out of 22,959 potential ballots were cast for a voter turnout of 19.13 percent. 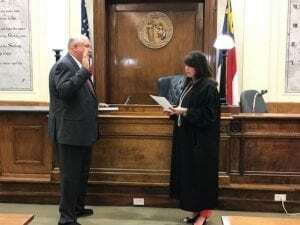 MURPHY, N.C. – After an extended executive session at Monday night’s meeting, the Cherokee County Board of Commissioners reconvened to hire Darryl Brown as county attorney. County Finance Director Candy Anderson explained the parameters of the hire would be for the remainder of the 2017-2018 fiscal year, which ends June 30, and the amount paid to Brown for that period would not exceed $12,500. The board unanimously approved the parameters of the contract and then unanimously approved the hiring of Brown. During the executive session, the board met and interviewed both Brown and attorney David Sawyer, who were the two candidates for the open position. 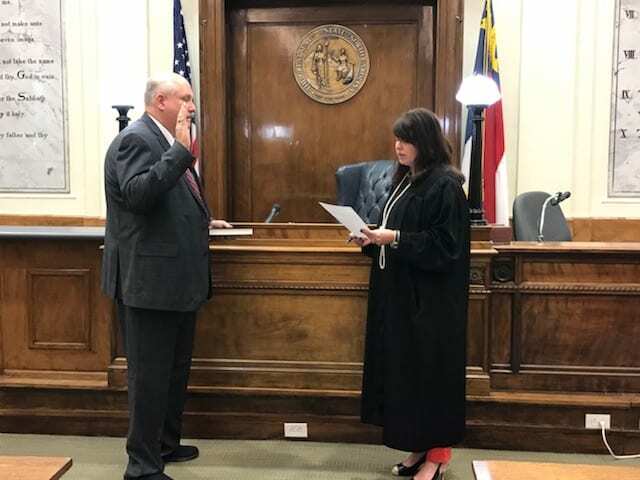 Cherokee County has been without a county attorney since the Feb. 5 commissioners meeting when the Board of Commissioners voted to dismiss former county attorney Scott Lindsay. In that decision, commissioners Dr. Dan Eichenbaum, C.B. 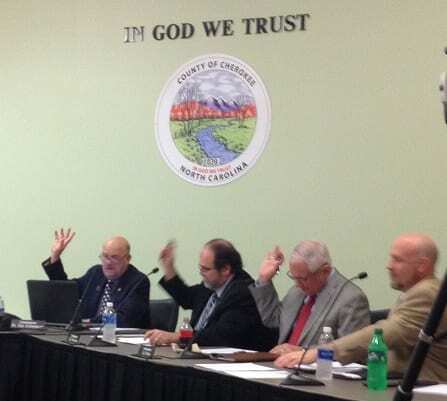 McKinnon and Gary Westmoreland voted in favor of Lindsay’s removal while commissioners Roy Dickey and Cal Stiles voted against the move. According to the terms of Brown’s appointment, he will receive a $5000 annual retainer fee, due upon hiring and again at the beginning of each fiscal year (July 1). Brown’s monthly fee is $2,500 a month, which is $250 an hour for a guaranteed minimum of 10 hours per month. Any time over 10 hours in a month will be charged a $175 hourly fee. 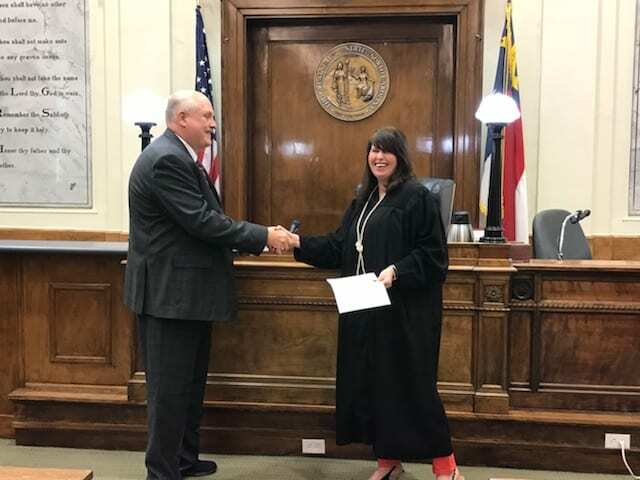 Brown will also receive a $500 allocation for books relevant to county representation and a $12,000 annual fee for on-call counsel for the Cherokee County Sheriff’s Office, half of which is to be paid at the beginning of the fiscal year (July 1) and the other half to be paid at the beginning of the calendar year. Also, the county will cover the cost of travel and training for the annual county attorney conference and annual sheriff’s conference. According his website, Brown is criminal defense attorney and native of Cherokee County. Brown received his Bachelor of Arts from the University of North Carolina at Asheville in 1989. In 1992, Brown received his Juris Doctorate from the University of North Carolina at Chapel Hill and was admitted to practice law by the North Carolina state bar. From 1993 to 1996, Brown served as assistant district attorney for the 29th Prosecutorial District of North Carolina, which encompasses Henderson, McDowell, Polk, Rutherford and Transylvania counties, and from 1996 to 2004, he served as assistant district attorney for the 30th Prosecutorial District of Cherokee, Clay, Graham, Haywood, Jackson, Macon and Swain counties. In 2004, Brown transitioned into private practice criminal defense in Murphy where he continues his practice to this day. 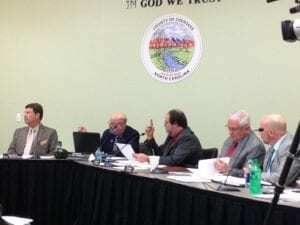 MURPHY, N.C. – The future of a red, nocturnal bull loose in the Unaka community was discussed at the Cherokee County Board of Commissioners April 2 meeting. Linda Dubois spoke in public commentary on behalf of herself and her husband, Jon Dubois. Linda DuBois explained they have been residents in the Unaka community for over five years, and in that time, they have invested labor and finances over $1,000 to clear a 5 to 6-acre portion of their 15-acre property that composes the front yard of their residence. “Lately, a red and curly haired bull has been tromping in our front yard to eat our sprouting green grass that we have seeded, mowed and carefully attended and, of course, leaving hundreds of piles of stinking diarrhea every night,” DuBois stated, while also presenting the board with pictures of the damage sustained in her yard. 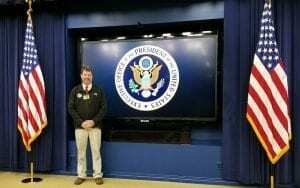 The Unaka resident continued to explain the bull has been “free ranging” in their yard at night only for the past month, and during the day, is nowhere to be seen. DuBois also stated she had spoken with the Cherokee County Sheriff’s Office (CCSO) about the situation on four different occasions, and the CCSO conducted an investigation to determine the owner of the bull, but no nearby residents claimed ownership. DuBois then asked the BOC what they could do to help her. After DuBois asked of the penalty of cattle theft in North Carolina, McKinnon reminded DuBois that no one had claimed it and it was invading her property. 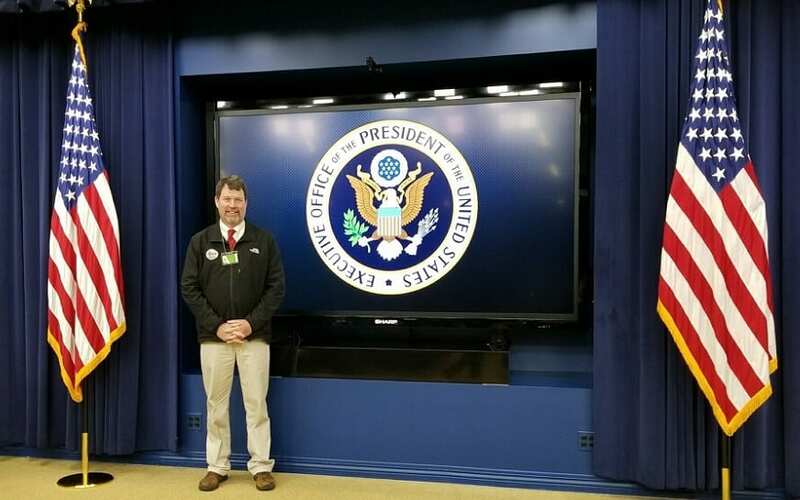 After further discussion, Sheriff Derrick Palmer offered to meet personally with DuBois the next day to discuss options to resolve the situation in accordance with free-roaming livestock laws. Later, the commissioners voted to affirm a county ordinance already in place concerning name changes for roads. According to Sam Davis, of the Cherokee County Emergency Management Agency, the consent of 75 percent of property owners on a road is needed to change the name of a road. At the March 19 commissioners meeting, Marble resident Anthony McCray addressed the BOC of his desire to change the name of Lambert Road, where he resides, back to Lower Vengeance Creek Road. McCray claimed the road name had changed in 2014 to reflect the surname of another resident, Ronald Lambert, without going through the proper channels of procedure. McCray also stated he felt a road should not be given a surname unless all residents of the road have that same surname. Ronald Lambert, also in attendance at that meeting, told the commission that reverting back to the previous name would cause undue financial stress for him since he is a licensed foster parent through the state and all of his licensing would have to be changed to reflect the road name change. After affirming the ordinance, the board told McCray and Lambert, both again present for the meeting, to resolve the issue among themselves, and if 75 percent of the residents on Lambert Road desired a new name, the residents could proceed with the process according to the ordinance. Daphne Dockery, register of deeds, addressed the board about establishing a definite daily deadline time for all land recordings submitted to the register of deeds office. Chairman Dr. Dan Eichenbaum suggested setting the deadline time at 4:30 p.m. and Dockery told the board the sooner daily deadline would help curtail overtime among employees in the register of deeds office. The issue was tabled so as to give Dockery more time to collect data to assist the board with making a decision at a future meeting. Also in public commentary, Aurelia Stone asked the commissioners to consider adopting a county ordinance that would require vacation rentals by owner (VRBOs) to have regular inspections and to contain fire extinguishers and carbon monoxide detectors. According to Stone, state law currently does not require these mandates as it does for commercially owned vacation rentals. Stone stated this lack of requirements puts guests at risk when renting a VRBO. The board approved and accepted two budget revisions. The first was an increase for revenue in the amount of $591 from a Smart Start Grant. The other revision was also an increase for an increase in the amount of $9,467 for state health promotion funding for mass media or messaging campaign to promote healthy communities. Commissioners scheduled three budget meetings for Friday, April 27, at 5:30 p.m., Thursday, May 31, at 6:30 p.m., and Thursday, June 28, at 6:30 p.m. in anticipation of finalizing the county budget for fiscal year 2018-2019. The April 27 meeting will be a departmental budget hearing, the May 31 meeting will be a budget work session for the county commissioners and the June 28 meeting is scheduled for the final adoption of the 2018-19 fiscal year county budget.